Imagine devoting your entire month’s paycheck just to get a few eggs and a couple of bags of pasta. This is the unfortunate reality for many of Venezuela’s 30 million residents, Vox recently reported. The country is currently in the midst of a massive political and economic collapse that has left the population hungry and in dire need of food. Venezuela’s inflation rates are currently the highest in the world, Vox wrote, and some economic analysts expect the inflation rate to hit 2,200% by the end of 2017. As a result, the bolívar, Venezuela’s currency, has been significantly devalued, making it more difficult and more expensive for the government and retail stores to purchase food to stock shelves. This has led to steep price tags and lack of access to basic needs. 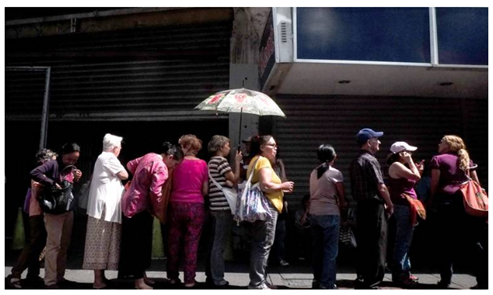 There are three types of markets where people can buy food in Venezuela. There are government-owned stores that offer food at a subsidized price, which makes them more affordable. These stores implement strict rules, however, CNN noted. Customers can only buy food on a certain day of the week, and they often have to stand in lines for hours — with no guarantee that there will be food left to purchase. Another option is the private supermarket, which is more expensive and still faces the same shortage issues. The last option is to buy food on the black market, a method that CNN reported is “illegal and can be dangerous.” This option is also incredibly expensive: Oftentimes, an item can cost about 15 times more than it would cost at the government-owned markets. When the national minimum wage is about 15,000 bolívars per month, or about $1,507.58 USD, black market prices are nearly impossible to afford. One bag of pasta can go for the equivalent of more than $300 USD dollars when purchased through illegal means, CNN noted. That equates to about one fifth of a minimum wage salary, and provides just a few meals-worth of food. A bag of pasta of the same size costs just a few dollars in the U.S. It’s worth nothing that, according to a 2015 study, 76% of Venezuelan citizens are living in poverty when it comes to income, the Wall Street Journal reported. While the country has turned to other means to bring food into the country — such as letting Jamaica pay off its oil debts with food, according to the Independent — it looks like food prices, and hunger rates, will remain sky high for the near future. Fresh milk is nearly impossible to find in Venezuela right now, CNN noted, so many are turning to powdered milk instead. Though it didn’t specify, assuming CNN used the same weight for its powdered milk evaluation as it did for pasta and flour, a kilogram goes for 7,000 bolivares ($703.54 USD), or nearly half of a minimum wage monthly paycheck, on the black market. Two pounds of powdered milk, which is just under one kilogram, goes for $7.24. 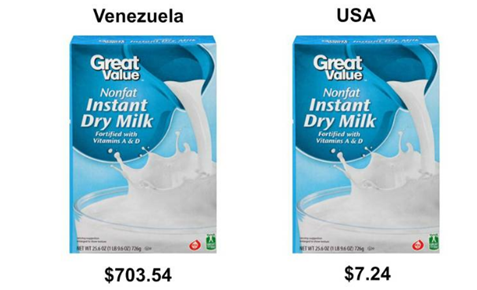 This means for the price of one box of powdered milk in Venezuela, people in the U.S. can purchase 97.2 boxes. Arepas, or stuffed, thick-tortilla like sandwiches, are a staple in Venezuela. They are made from maize flour, which can cost about 3,000 bolivares ($301.50 USD) for just one kilogram of the flour, CNN noted. The same sized bag goes for about $9.27 on Amazon in the U.S. 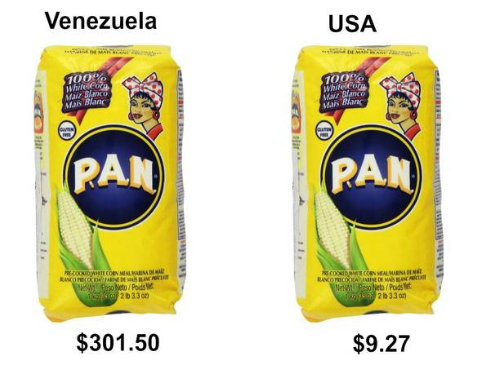 This means that for the price of one bag of flour in Venezuela, people in the U.S. can buy 32.5 bags of flour. Pasta is an affordable staple in the U.S where two pounds (which is approximately one kilogram) is just $2.50. In Venezuela, a kilogram of pasta currently sells for 3,000 bolivares ($301.50 USD) on the black market, CNN reported. 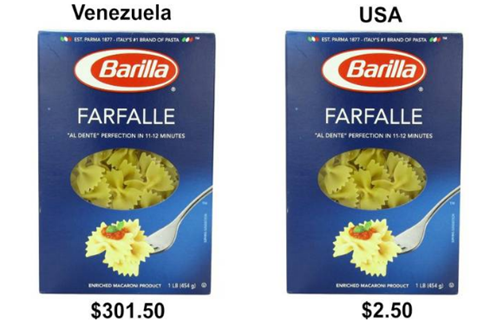 This means for the price of one box of pasta in Venezuela, people in the U.S. can buy 120.6 boxes. When people talk about affordable sources of protein, eggs are often first on the list. Unfortunately in Venezuela, a dozen eggs can cost 1,500 bolivares ($150.76 USD) on the black market, the Los Angeles Times noted. In the U.S., the average price of 12 eggs is just $1.49. 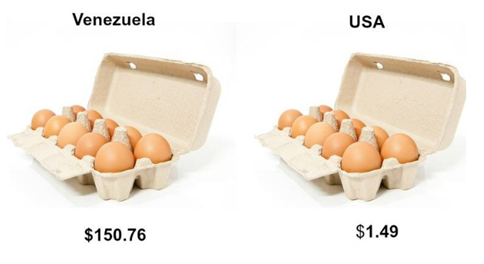 This means that for the price of one dozen eggs in Venezuela, people in the U.S. can buy 101 dozen eggs. While fresh produce is hard to find in Venezuela right now, when it is available it is expensive. 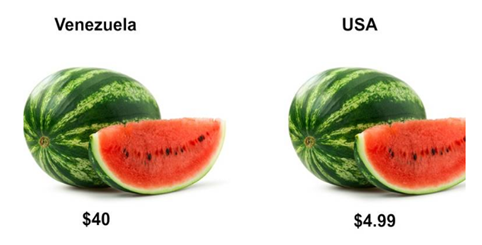 Watermelon from a government subsidized store can go for 400 bolivares ($40 USD), the L.A. Times reported. It likely costs much more than that on the black market. In the U.S., watermelons cost just $4.99 at a number of Sam’s Clubs locations. This means for the price of one watermelon in Venezuela, you can purchase 8 watermelons in the U.S.
Every once in awhile, a fancy coffee shop will sling a $16 cup of coffee, but for the most part coffee tends to be affordable — unless you live in Venezuela. According to Forbes, a 1/2 kilogram bag of ground coffee goes for 2,000 bolivares ($201 USD) on the black market. In the U.S., it’s possible to purchase a one-pound bag (which is just a little less than half a kilogram) for $19.88 on Amazon. 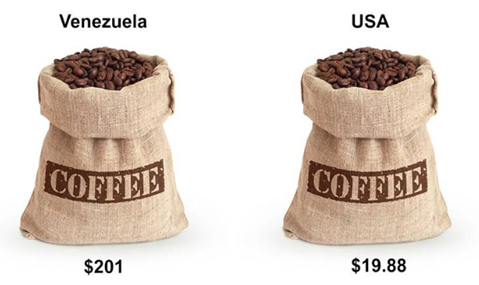 This means that for the price of one bag of coffee in Venezuela, people in the U.S. can purchase 10.1 bags of coffee.